We had a short, succinct, deep and efficient meeting tonight affording me the luxury of reporting back promptly. There was no dissension amongst our compact cabal. As we gushed ver Hamilton we are grateful to Fergal for the suggestion. The book was very well received. Although a hefty read, all agreed it was a very satisfying, appropriately detailed and thoroughly enjoyable experience. 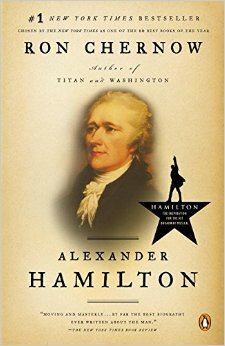 Although somewhat slow to start (and watching the Kindle chronometer can raise some discouragement) the tale becomes very engaging and a tribute to Chernow’s authorship – rightly earning the definitive biography title. A fascinating time to be exposed to, colourful characters well cast and what seems a very even handed presentation. The three present all gave the book a full 9 marks each. Pretty solid approval all around. We will await the absentee ballots as everyone gets a chance to move on through the book – a journey well recommended by tonight’s respondents. Seeing the music at this point is actually on the list. Will we see it in Dublin Fergal?